The architect who built UC Santa Cruz’s acclaimed Science & Engineering Library recently sat down for a conversation with his son—a 2014 graduate—on the evolving use of the library as plans shape up for changes to the iconic space. Renovation is in the air on Science Hill. Big changes are coming to UC Santa Cruz’s award-winning Science & Engineering Library, with plans in the works to evolve the space into even more of a community hub for students and faculty by adding new resources for study, collaboration, and research. The library, designed by the architectural firm Esherick Homsey Dodge & Davis (EHDD)—which has designed and built buildings on many UC campuses—is acclaimed for its eco-sensitive layout, its abundance of natural light, and the way the spacious-yet-intimate building blends with its natural surroundings. The renovation of the 57,000-square-foot library, which opened in 1991, will play to these existing strengths while increasing the number and quality of study rooms and collaborative workspaces. Patrons will also have access to a café, an “information commons,” and a laptop bar, among other amenities. These changes will be privately funded. In fact, the Science & Engineering Library renovation is a key initiative of the Campaign for UC Santa Cruz, an ongoing $300 million comprehensive fundraising effort. These improvements are bound to make the library more vital and interactive than ever, University Librarian Elizabeth Cowell said. The library will shift from a space that encourages quiet, individual contemplation to widespread collaboration—”collision space,” in modern library lingo. It will be a “wired” hub, but it will also foster face-to-face meetings and classroom learning. Along with workstations and the café, these changes will transform the library, though it will continue to have abundant space for quiet individual study, reading, and preparing for finals. The principal architect in charge of the original library design was Chuck Davis, who is now retired. Nodding to continuity and campus history, UC Santa Cruz has hired EHDD to “design” the renovation. In the course of his studies, Hayden complained good-naturedly to his dad that there weren’t enough electrical outlets in the building for students to plug in their laptops, tablets, mobile phones, and other devices. In doing so, he started an ongoing, friendly, and funny conversation with his father about the evolving use of the library. 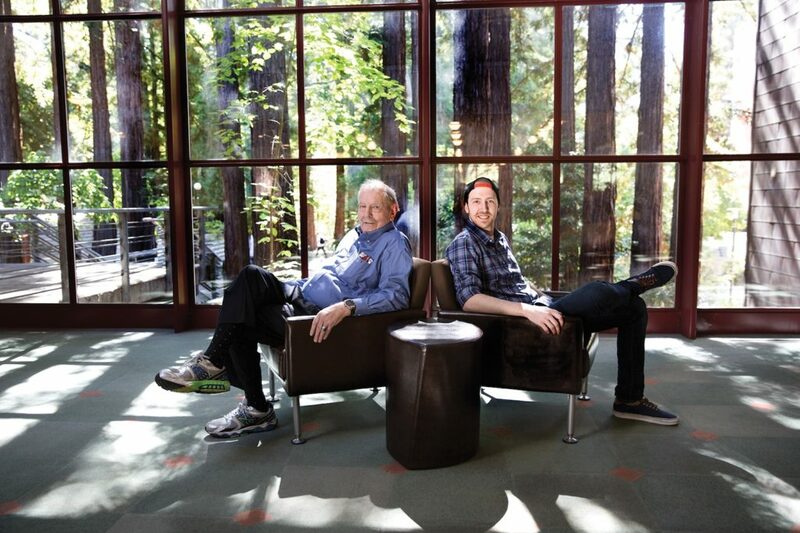 On a cool summer afternoon, UC Santa Cruz Magazine sat down for a freewheeling, far-ranging conversation with Chuck and Hayden Davis about the past, present, and future of “Sci-Li.” The father-and-son chat took place in the library Chuck Davis helped design. Chuck Davis (left), the principal architect in charge of the original Science & Engineering Library design, takes a break at the library with son Hayden Davis (College Nine ’14, MCD biology), who studied in the library his dad helped build. Dan White: Could you talk about your original vision for the building? Chuck Davis: We had an incredible site. I was determined to save as many trees as we could. We wound up cutting down only 11 trees on a heavily wooded site. The building has this kind of stepped profile that weaves in and out through the trees. Over the years I had been walking through the woods and saw what it meant to have large windows (looking out at) trees and fog. Mostly I wanted to make the library a very comfortable space. Dan White: Hayden, what was it like to spend so much time in a space your father designed? Hayden Davis: This building is where I studied for all my tests. It was weird at first, but it makes you appreciate his art a lot more.… Certainly, I think it is a beautiful building. That helps a lot. I was the kind of person who always sat by the windows. If I have to study and cram into one of those cubicles all night, I don’t want to just be able to see my computer screen. I want to look out the window into the forest and see the redwoods that helped me stay sane when I was here until 2 a.m. But when a building ages, there become things that don’t work as well, and I butted up against those too.… As I spent more time here, I grew more openly bold in critiquing (my father’s) work. Dan White: The building was completed in 1991, but enormous changes in technology and communication happened only a few years afterward. Hayden Davis: And a phone charger! Chuck Davis: So everybody would gang up and they would bring plug strips and then there would be fights over the outlets for the plug strips. Hayden Davis: And on the bottom floor of the library, you would notice the tables that didn’t have outlets by them; people just didn’t sit at them. They knew they could sit there for an hour but after that, they’re out of juice. I used to get here at 9 a.m. knowing full well that if I came here at 1 p.m. that there would be zero outlets available. Dan White: How did you first broach this topic to your dad? Hayden Davis: Pretty bluntly! He used (my comments) as feedback. In a weird way, I’m a client in this situation. Dan White: And this feedback was given affectionately, of course. Hayden Davis: Yes, fully affectionate. Dan White: What do the renovation and future changes mean do you? Hayden Davis: Something this library lacked that McHenry had—you would go onto the ground floor (at McHenry) and see so much open collaboration, with the café right there and people talking. Then you’d go to the other floors and you’d have the library for reflection. But with the Science Library, when you walked in, it was like walking into a funeral or something. Hayden Davis: It was a different vibe. Chuck Davis: To be fair to the building, (the renovated version) will have a café on the bottom floor. … And part of the original design strategy was to make the place really quiet. The carpet was heavy duty. It had acoustic tiles. That meant “funeral parlor” in (Hayden’s) lexicon. Hayden Davis: But that was designed before everybody had headphones. For me, I could get into that solo study zone because I could throw on headphones so I never needed that dead-quiet space. I could just make my own. Chuck Davis: But that was also an excuse to go to Best Buy and buy the $250 Bose super-enclosed noise-canceling headphones. Dan White: But it sounds like the “funereal” aspect was more of a question of function than design. Hayden Davis: It definitely was, amongst my people. It was considered the “serious” library. If you really had to get down (to business) by yourself and study and get into your own space, people went to the Science & Engineering Library. If you had collaborative stuff with a big group of people, you went to McHenry. Dan White: The library will preserve quiet study space on the upper floor, but it will add in the collaborative learning experience while maintaining some of the high-demand quiet space. What is it like for both of you to see this family creation get reconfigured? Chuck Davis: Change is inexorable in a university. If you design university facilities, and you are thinking you are designing the memorial to Chuck Davis or anyone or anything, you are in the wrong business. That is just the way the university works. That is why I like to work for the university. You’re working with incredibly bright people, very creative, always probing the edges. Hayden Davis: To see the library change is exciting for me. Just walking into (the Science & Engineering Library) two years after graduating, it’s already different in a way that I like. I see more people sitting on the ground floor today in the middle of the summer than there would be in the middle of the year when I was here. It’s more of a community space. Chuck Davis: The original design allows for flexibility. Hayden Davis: One thing my father always told me about university buildings is, you are designing the bones. The inside of it is going to change all the time, as technology advances, as the need for something disappears and other needs arise. But the outside of this beautiful building, the views into the forest—that is the part that is never going to change. For more information about the Science & Engineering Library renovation, visit campaign.ucsc.edu/priorities/divisions/library.